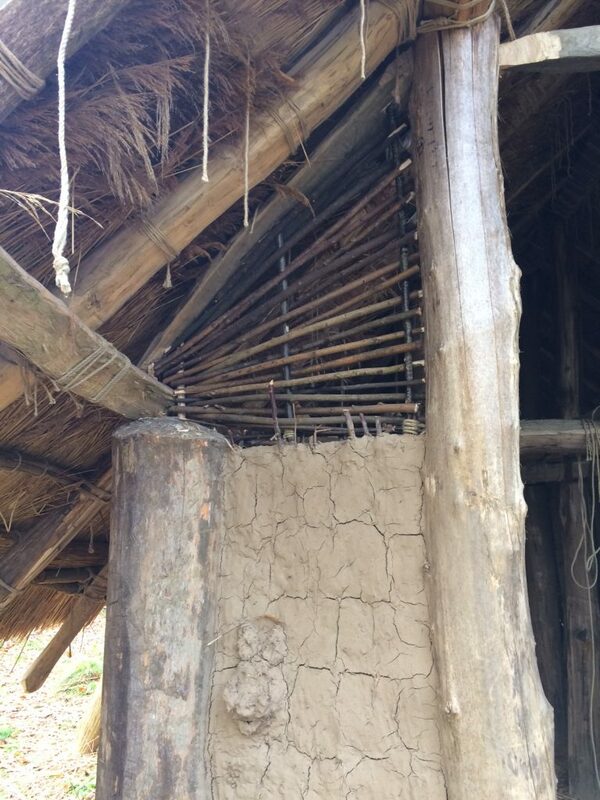 The Neolithic Gods are clearly with us on this project! Somehow, the weather seems to have favoured us over the last year in an extraordinary way and yet again, despite the atrocious weather at the weekend, we are welcomed back to the project with bright and mild days this week! Today the volunteer teams are quickly back into the swing of it after a three week break. 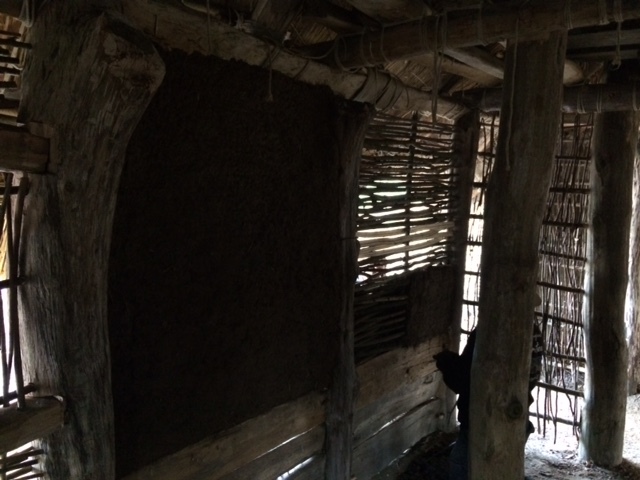 Inside we have the final wattle sections being constructed in the livestock end of the building. Work on this continued while I was away and this end of the building is nearly complete. Outside, more volunteers are starting on the daubing of these sections and the race is now on to complete the walls so we can lay the floor!. It will be fascinating to see the effect on Derek and Edward’s shutters when the walls are complete. Will they provide enough light in the darkest end of the building? If not, the potential and knowledge is now there to replace other daubed panels with more shutters. This building will (as hoped) undoubtedly change and evolve as time goes by and as its functionality raises more and more questions. The end is also in sight for the roof. 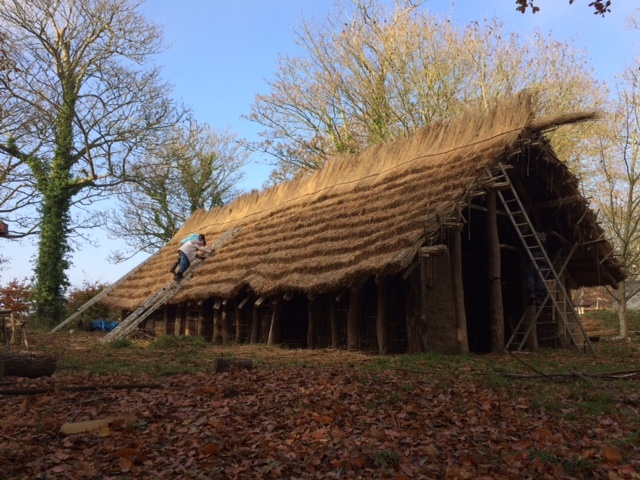 Thatch layer 8 continues on the south side of the roof – half of this layer remains before we move onto layer 9. Then we tackle the final layer – the ridge! 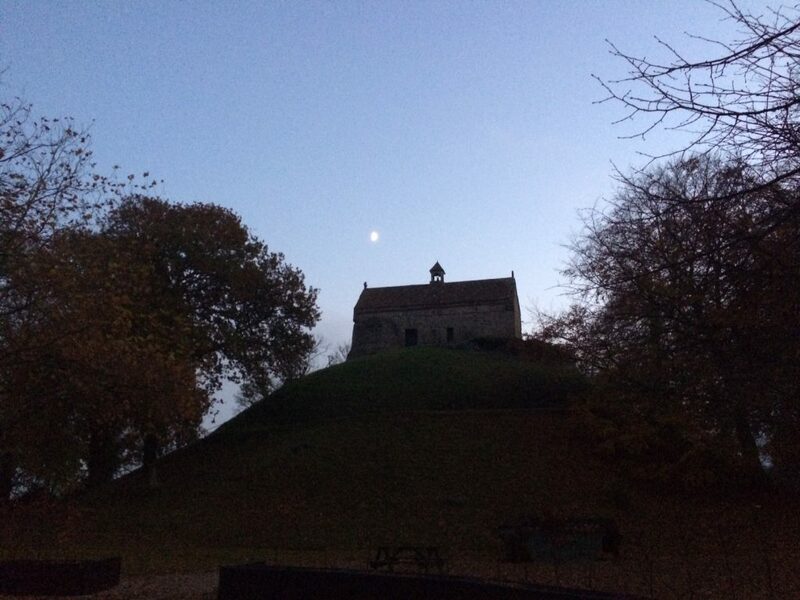 Fine weather greets us again, although a chilly wind reminds us it is November! 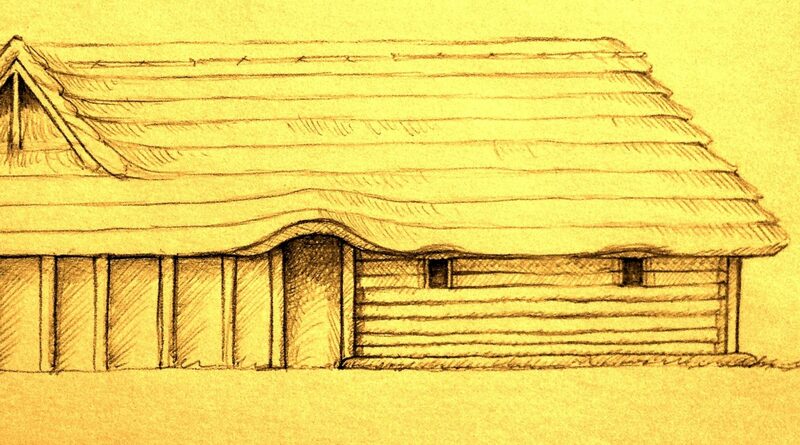 Wattle panels are proceeding at a pace in the livestock end of the building. Only 2 large panels remain before this end of the building is enclosed. Daubing also continues at this end of the building. Tim has trimmed part of the overlapping reed at the ridge line to allow layers 8 and 9 to overlap from the south side. These last two layers should block out any residual light from the roof and we will begin to get a feel for the final interior space. What is clear – even at this stage, is the difference in light levels between the south eastern end of the building (the main entrance) and the livestock end of the building. 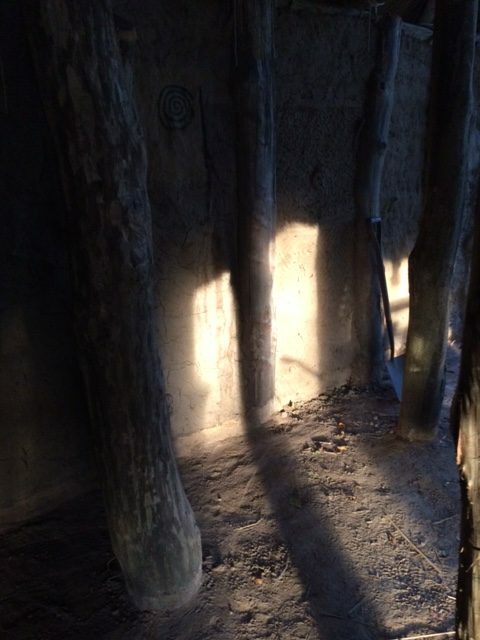 The winter sun tracks through the doorways from early morning until around midday. This offers a surprising level of light within the first 6 metre bay of the building by which to work during the winter months. This is then enhanced in the afternoon from around 1.30pm until sunset when the light is given unimpeded access to the end of the building through the open door on the southern wall. It has been amazing to see the effect of direct low winter sunshine on this area until the sun dipped below the level of the nearby hedge (around 4.30pm). This can’t be accidental can it? The weather continues to be unseasonably fine and mild. 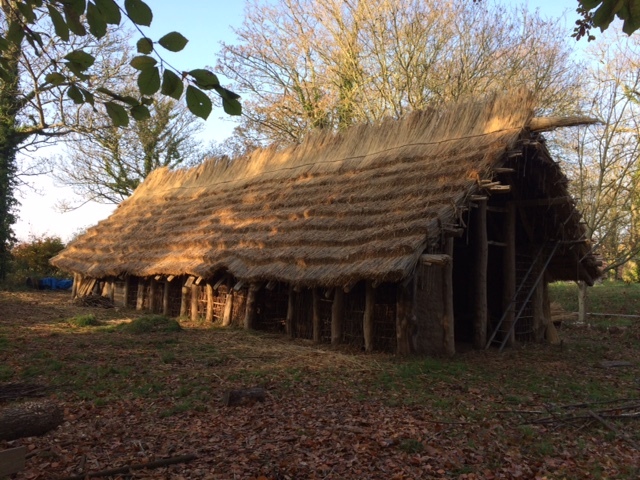 Today the volunteers are still pressing on with the main tasks of finishing any remaining wattle panels and the final layers of thatch on the south side. We would like to finish the remaining section of layer 8 and the whole of layer 9 before the end of the week so we can focus on the ridge during the next visit. We are also installing some horizontal timbers at the front of the building to support the upper wattle work that will eventually seal the gable end. These lintels sit above the main door lintels and also effectively for m a box frame for a shutter (this may be a simple leather flap or wattle panel or a more elaborate carpentered shutter) that can be opened on days when more light or ventilation is required in the building. Astra has been working on her shutter this week. 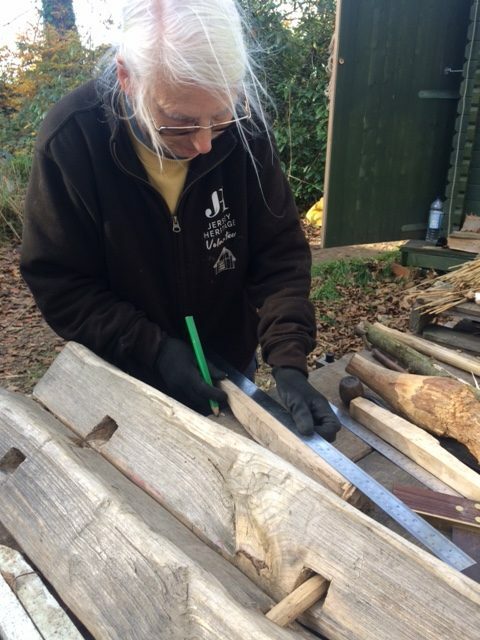 Today she had completed the first stage of matching and joining the two individual ¼ split timbers that will form the shutter. Our first mirky morning of the week. 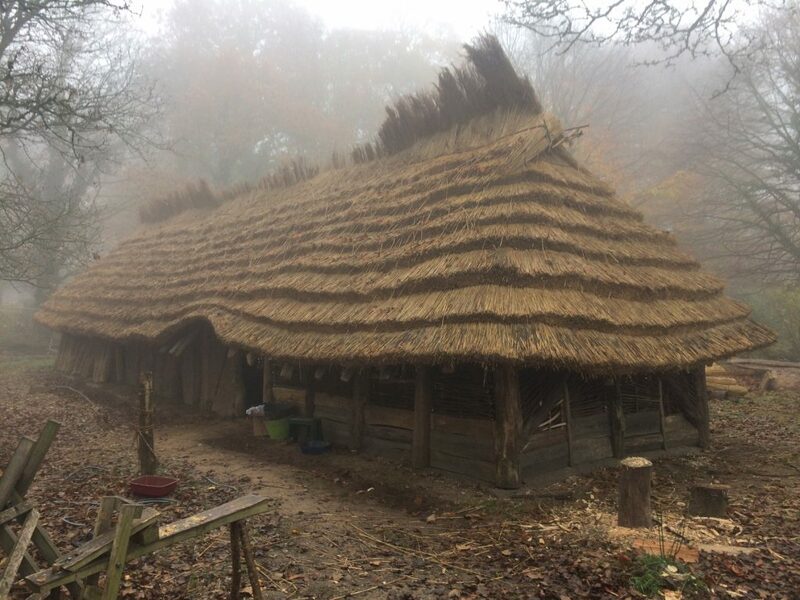 The mist is hanging over the longhouse and wrapping the site in its quiet blanket. 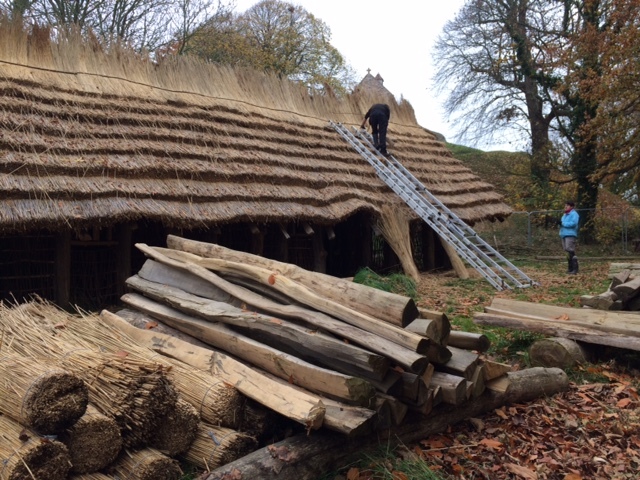 Thatching team 1 is finishing layer 8 on the south side of the roof. Their intention is to immediately press on with layer 9. 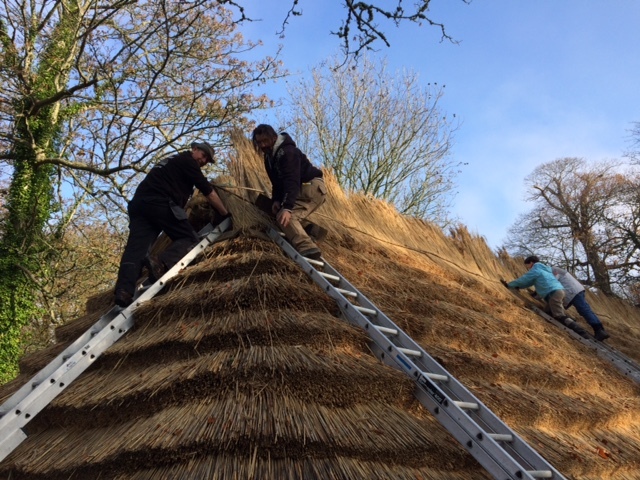 Thatching team two have started layer 9 from the other end of the building. Our mission is still to try and complete layer 9 by the end of tomorrow! Astra is forging ahead with the final shutter of the project (for now!) which will fit the frame already in position in the living space. Patsy and Edward are working on the last wattle panel in the livestock end of the building! This end of the building is becoming darker as the days go by and each panel is filled. By the time the daubing is finished it will be the darkest part of the building. 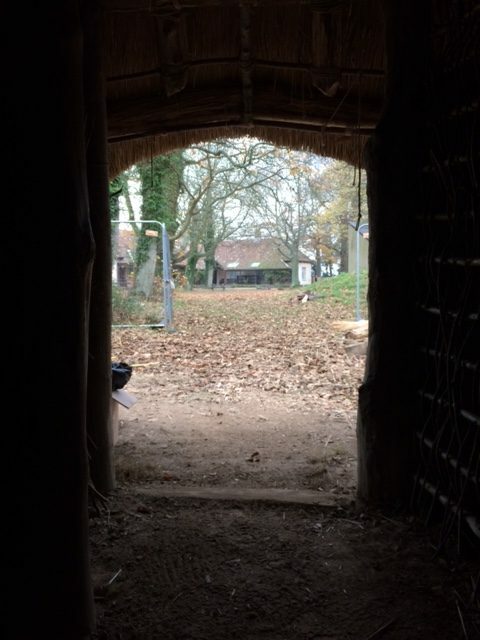 It may be that two shutters and reflected light from the north doorway isn’t enough to illuminate this space, but the volunteers now have all of the skills and know-how to replace wattle panels with more shutters if required. 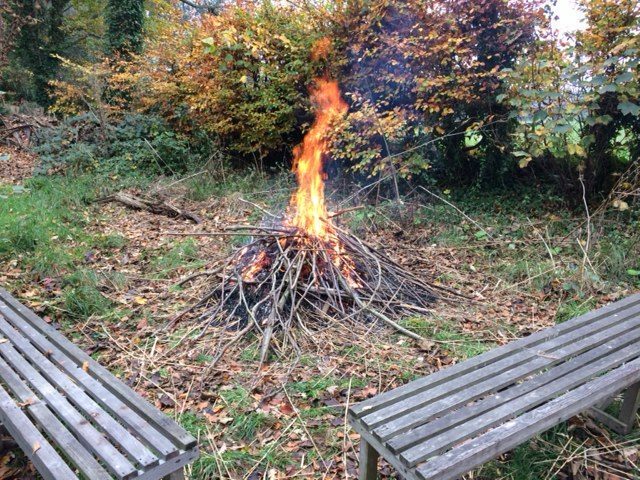 Today we have also had a site tidy – gathering all of our split and prepared pieces of timber and sorting them into sizes. This timber will form the framework of furniture, beds, platforms, work benches, and anything else the interior may require. The final bundles of reed are also being organised into piles for layer 9 and the ridge. Layer 9 requires 60 bundles (one side) and the ridge will need around 100 bundles. The work week is ending with another foggy morning! 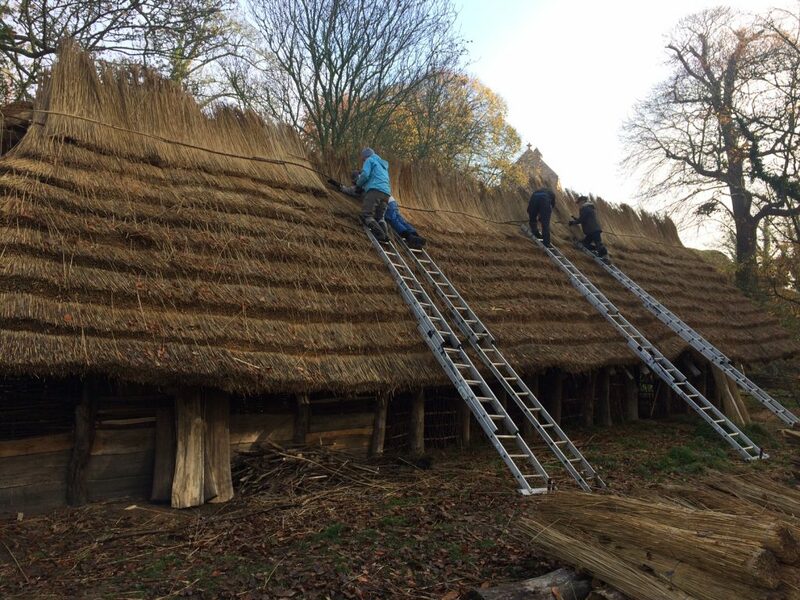 Two thatching teams are busy working on layer 9 with the hope of finishing today. 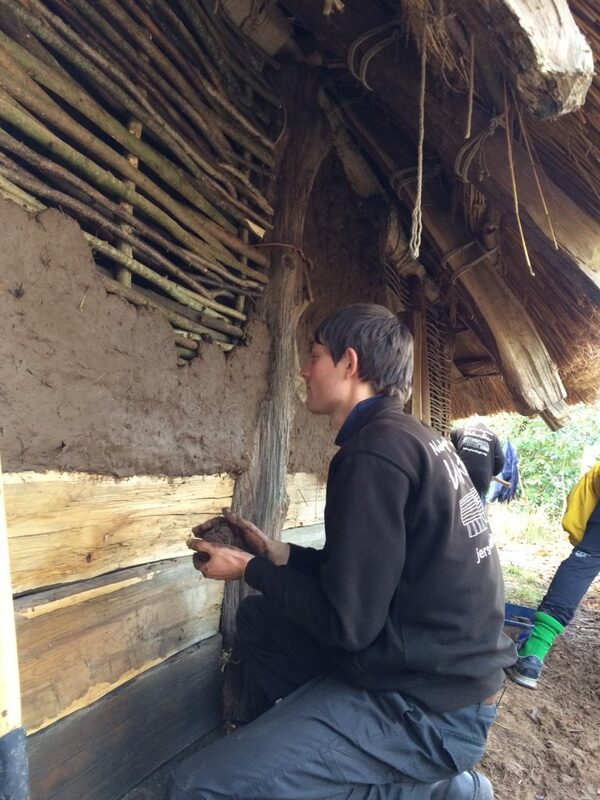 We also have a team of volunteers on daubing – working on the newly installed livestock wattle panels. 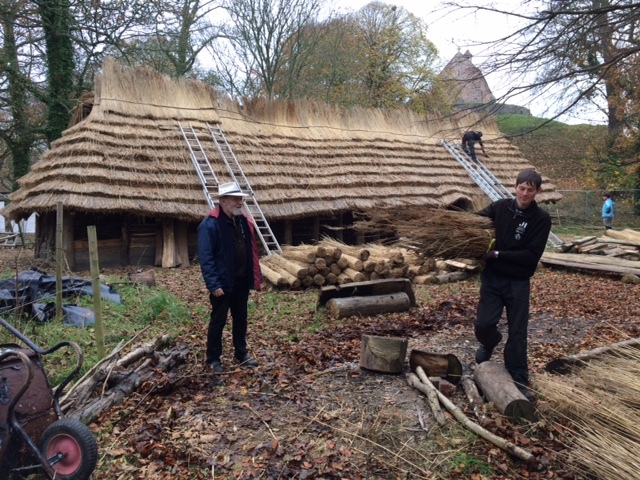 Derek has finished one of the tricky wattle panels at the gable end and is moving onto the other one. What a great end to the week! It is so fantastic to see the completion of all the thatch layers. We have a weeks rest now and then we push on with the completion of the roof with the ridge.